So having rested for several days, psyching ourselves up for the final state, we set off and left Cascade Locks. 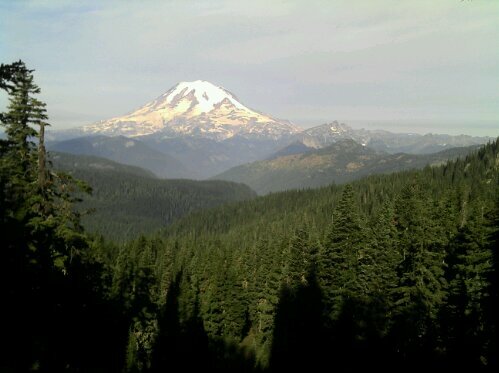 As we crossed the Columbia River on the Bridge of the Gods we entered the Evergreen State’; Washington! Everything we had read about Washington said that we should be prepared for and expect colder temperatures and lots of rain! 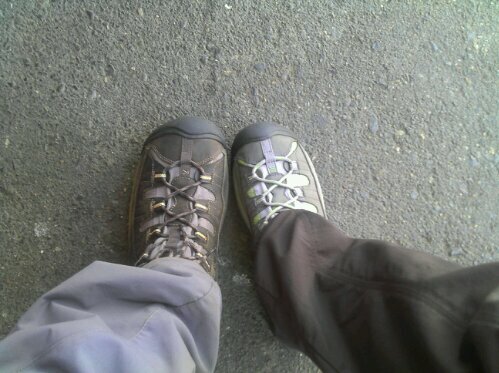 So one of the gear changes we made was to switch our trusty trail running shoe for waterproof boots. I had been suffering with tendon issues in my foot, so I hoped that the stiffer boots would help let the foot recover. The waterproof lining of these boots would also help protect us from all the rain and cold. a sudden Washington was much wetter and colder! We later learnt that the thunderstorm started 117 wildfires across the state! These fires were to mask a lot of the mountains in a thick layer of smoke. Fortunately the wetter weather didn’t last long, and after a couple of days the sun came back out to greet us. The cold was to last though and as we pushed further north the temperatures kept falling. 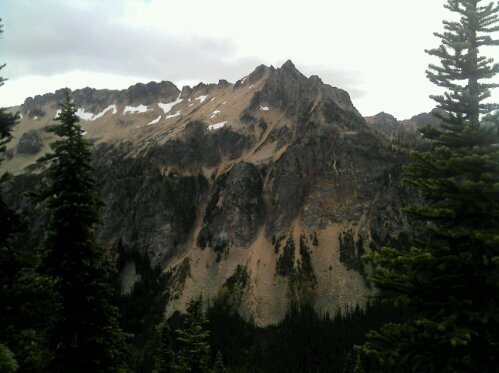 Although we were eager to get to the end of the trail, we kept stalling our progress whenever we had the excuse. We ended up talking zero days in all but one of Washington’s resupply towns. We were mentally and physically tired and ready for the end, but at the same time needed more and more time in town to recover after each section. Fortunately though, Washington also had some of the nicest town stops on the whole trail. Skykomish was a bit quirky, but also a nice place to chill out. But the best stop we had was in the very remote community of Stehekin. This place is idyllic and the perfect place to get ready for the last push to Canada! North Washington’s landscape was beautiful, with the larch trees turning bright yellow and huge, imposing mountains surrounding us! It was also though going! Some days would see us climb 3000ft to the top of a ridge, then drop 3000ft straight back down, cross a river, then head back up to the next ridge! 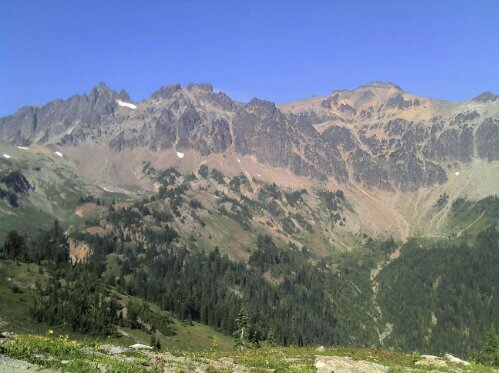 Having left Stehekin we were on our very last section of the trail. It was with some sadness that we were about to get to the end, but we were also very ready to finish! During our last few days the temperature dropped to painful levels. Our drinking water and even our tent froze solid! Then came the moment we had dreamt and imagined for months! 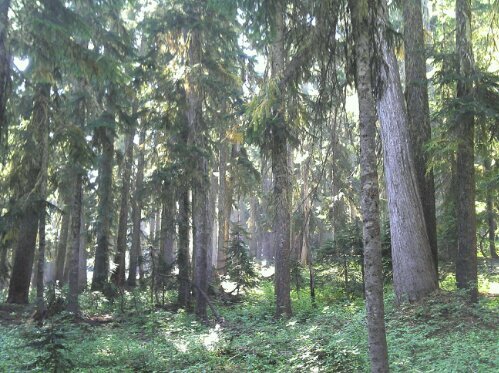 As we walked along the final valley we came to a clearing in the trees, intersected by a clearcut. In the middle of the clearing stood a monument like the one we had stood next to 163 days earlier. This was it! 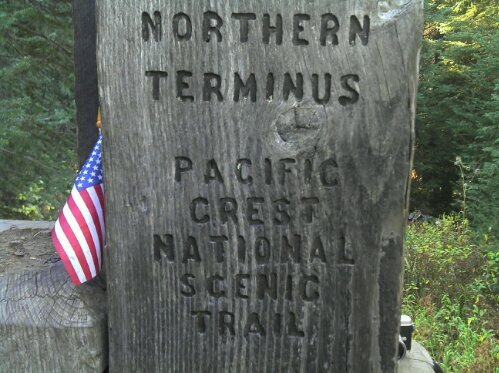 Monument 78, the northern terminus of the trail, the Canadian border and the end to what had been an adventure of a lifetime! We had left a continuous line of footsteps over 2660 miles of some of the worldsmost amazing landscapes. We had walked from Mexico to Canada! Mentally and physically one of the toughest things we had ever done, it is also something that we will never forget. It has changed us in small ways that only we and those we have shared the adventure can ever truly understand. And to those who did share in the adventure, I salute you! From the trail angels who gave us magic out of the kindness of their hearts, to our fellow trail trash who we shared that line of dirt with, to those back home who supported us from afar. Thank you! Many many congrats Alesdair and Sarah; I have been following you people since you left UK, though not that regularly at the end. But this is an amazing achievent! There have been many times I kept thinking about you, like you think about relatives and friends that are far away and you are not exactly aware what they are up-to; and you finally give out a good hope sigh and pray for them. My prayers have been with you! What about your PR status? Any news? I hope to be in Canada by summer 2013. Would definitely try to see you guys if you are there. Thanks for following our adventure. It certainly was an amazing adventure, and one that probably hasn’t properly sunk in yet. I think it may take many months or even years before we can really reflect on the journey we have been on. Yeah, the PR finally came through. We actually got our medical requests 3 days before flying out to the US! So we ended up having to run around like crazy trying to organise it. Then while in the US the PR came through and we activated it once we had finished the trail. That now buys us 3 years to make a decision about what we want to do. 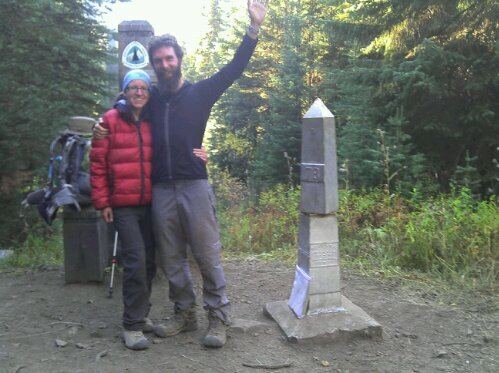 Well, my dear Ali and Sarah, the end of your PCT story was a long time coming on this site but here it is and so many will enjoy reading this and I can finally put the ‘last piece of the puzzle’ in my journal of your adventure. It has been a wonderful story. But ……it is not really the end of your adventure – this will continue into your life ahead. I, and so many of us, will so look forward to your photographs, videos and any talks you may give. I’ll always be totally in awe of what you have done. Team Bear and Boy are the best! My love – Muzzy. Better late than never eh? And yeah, don’t worry, you will have to endure the somewhat lengthy slideshow/talk when it is finisher and ready! Hello Catch-23, thank you very much for following us, and thank you also very much for warming us up and feeding us on that cold rainy day! That was some of the best placed trail magic on the trail! Thanks for passing on message to Angela and Duffy, as they certainly were an inspiration.